The relative wind is a relationship between the direction of airflow and the aircraft wing. In normal flight circumstances, the relative wind is the opposite direction of the aircraft flight path. • If the flight path is forward then the relative wind is backward. • If the flight path is forward and upward, then the relative wind is backward and downward. • If the flight path is forward and downward, then the relative wind is backward and upward. Also relative wind can created by a stationary object and the motion of the air around it, as when an aircraft is pointed down a runway for takeoff. This is why takeoffs are normally into the wind. During takeoff, when the aircraft is stationary, the relative wind would be the motion and direction of the airflow around the aircraft created by the wind. As the airplane accelerates down the runway, the wind and motion of the aircraft are combined to create relative wind. Once the aircraft becomes airborne, only the motion of the aircraft produces relative wind, and the relative wind becomes opposite and parallel to the flight path of the aircraft. 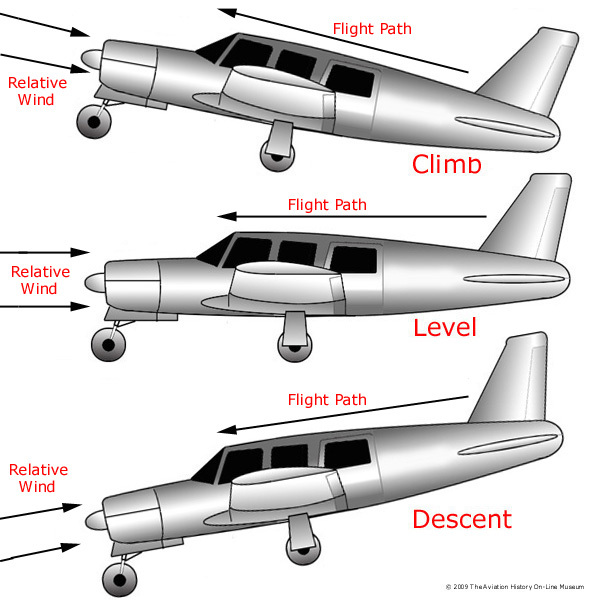 Although the wind can affect the ground speed and aircraft drift, the relative wind will always remain opposite and parallel to the aircraft wing. Refer to the page on angle of attack for comparison.